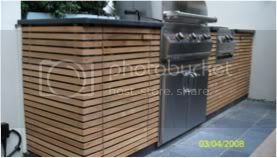 Outdoor Kitchens - The New "In" or a Passing Fad? Outdoor kitchens as we see them in today’s gardens are nothing like the outdoor ovens, BBQs or grill pits we have seen in recent years. These kitchens are as fully equipped if not more than indoor kitchens. Outdoor kitchens as we see them in today’s gardens are nothing like the outdoor ovens, BBQs or grill pits we have seen in recent years. These kitchens are as fully equipped if not more than indoor kitchens. The advent of utilising the outdoors as an extension of the interior, which began in post war America in the late 1940s, slowly but naturally pushed the ultimate progression to having a fully equipped outdoor kitchen- whatever the weather! The landscape architects such as Thomas Church, James Rose, Garrett Eckbo and others, were innovators in the development of truly utilising the garden as an extension of the inside. The use of the ‘yard’ as Americans call it, allowed them to extend their social time to the outdoors. Helped by clement weather in California where the designer’s above practised. The post war houses built for repatriated army staff were only about 18m2, so the yard was seen as extra liveable space. Gecko and Rose saw this as an opportunity. Function was not subjugated by aesthetics or vice-versa. The development of this trend was continuous throughout the decades with fashionable adjuncts such as conversation pits and ultimately fire pits added to gardens. The defining time for the outdoor kitchen in the USA and later on in the UK was during the 1980s when Martha Stewart (the cooking and all round home goddess) plunged into the ‘lifestyle’ market which was emerging. TV, books, accessories, cooking, gardening and an increase in disposable income pushed the idea that if one had a home, one could make it look like on TV. In the 1990s garden designers again thorough the medium of TV and media shows in gardening, helped to push more innovative ideas forward. The deck was already an established ‘must have’ in the USA and when it came to the UK, via TV programmes like Ground Force, the scene was set for pushing the boundaries further. From casual drinks evening with friends to more elaborate dinners, the garden was not just a patch of grass with some flowers to look at; it was truly a ‘room’ to use when the weather was fine. The building boom of the late 1990s and the spread of DIY superstores, meant that people could actually build their own fantasy garden. One would think that outdoor kitchen would have a limited use in the UK. In hot weather countries this makes complete sense. Australian take to the outdoors with gusto and most gardens there not only come with the ubiquitous pool but usually also with a BBQ area luxurious and extensive enough to rival any normal kitchen. So what of the UK? 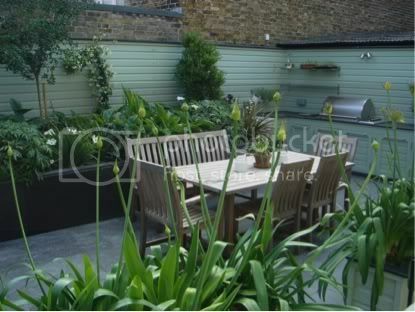 So outdoor kitchen are free standing or built-in – think normal kitchen but impervious to weather. 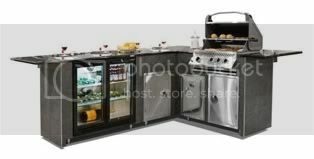 The choice of elements is endless: teppanyaki grills, fridges, pizza ovens, hot plates, domed BBQs, sinks ... see what I mean? Stainless steel, stone, tiled or even smooth concrete – the choice of materials is endless and if your budget is vast then so is the choice! Entertaining at home and with the kind of weather we have been having in the last few years, is the new “dining out experience”. If the space has a canopy of some kind then you can even use it when it rains. BESPOKE OR MAKE YOUR OWN? You could make your own kitchen outside but ensure that the materials you will use can withstand our weather: sometimes very hit, damp and humid. If the outdoor kitchen is going to be far from the house, then it would be good to install a sink, a fridge of some kind, a preparation area and storage. Remember to also have level ground. It’s important that whatever solid structure you build, is sound. If you feel that the more professional touch is needed, then there are now a multitude of outdoor kitchen providers in the UK. The outdoor kitchens range anything from £2,500 upwards – it just depends on the extras you want to install. But a bit of a splash for your cash will probably start at around £6000. Hard standing is not included but most kitchen installers will offer this build service too. 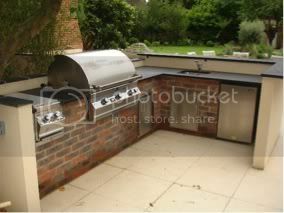 Photographs kindly provided by BBQIsland and Fire Magic.